Then It’s a Habit – Entertainment Ave! Lately my habit helper is an app called Way of Life that I heard about from listening to The Tim Ferriss Show podcast and his guest, Kevin Rose, as they were talking about things for 2016. The app is free to start, giving you three things you can track, but if you want to pay attention to more you can give them a few bucks and track as many things as you want to your heart’s content. It follows a yes, no, or skip system, and you can dictate whether or not the thing is good or bad for you. For example I’m paying attention to five things: Reframing challenges (I tend to let things get me too upset), getting up a little earlier (so I can get a few more things done), meditating (it’s all the trend, and I’m nothing if not a trend follower), more exercise (why not? ), and flossing (I never did this consistently). After two weeks I’m doing pretty well with the flossing and getting up earlier, the reframing challenges is getting better as I’m finding when I start to get flustered I think that I don’t want to have to select “No” at the end of the day so I work to change my state of mind, and I visually see that I need to work on my meditating and exercising. So far I’m off to a good start, I think. There’s a lot of stuff out there on habits, what creates them, how to break them, and one of the best I found was a book called The Power of Habit: Why We Do What We Do in Life and Business by Charles Duhigg. I did like his breakdown of habits, and found the story of the marketing of Febreze and how it relates to the habits of the cleaning public fascinating. His breakdown of how to begin the process of eliminating a habit has also been the best advice I’ve found to date, and his look at how habits develop has also been helpful in my being able to see trends in my own development of habits, both good and bad. Many of the things on habits out there try to put a length of time it takes to make a habit. 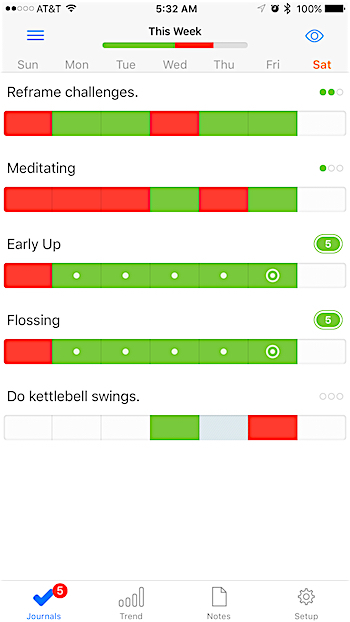 I suppose we’ll see how long I can stick to this habit of tracking habits, and if that in itself can be a true habit. That’s kind of weird in itself because if I fail in my initial habit of tracking my habits, does that mean all of the other “trying to better myself” habits will also fail? I’d really like to know how long it takes to make a habit because then there would be an actual length of time I can say “This is now a habit,” and maybe God has it right at the 40 day mark, but in the end I wonder: How long does it take to declare a habit a habit? Next Next post: The Promotional Calendar Isn’t Dead?